These plated leg protectors are crafted entirely from mild steel, in one of two different gauges. The 18 gauge version is lighter and better suited for LARPing, costuming, and light reenactment, while the 16 gauge version is a heavier, thicker metal that is made for combat and reenactment, making it suitable for SCA events too. 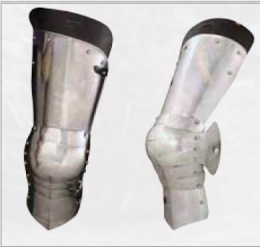 This armor set consists of a pair of pieces, which feature connected greaves, poleyns, and cuisses, which offers protection for the upper and lower leg, as well as the knee. The armor is also articulated, to ensure the full range of movement. They come complete with leather straps and buckles, for securing the plates. They are offered as a matched set. This page was last modified on 9 May 2014, at 19:19.